2.Creates a sense of security for people when they are being held and hugged by a human. 3.The blanket is helpful to those people who have Autism, Anxiety, Child hyperactivity, sleep disorder and sensory disorder. 4. 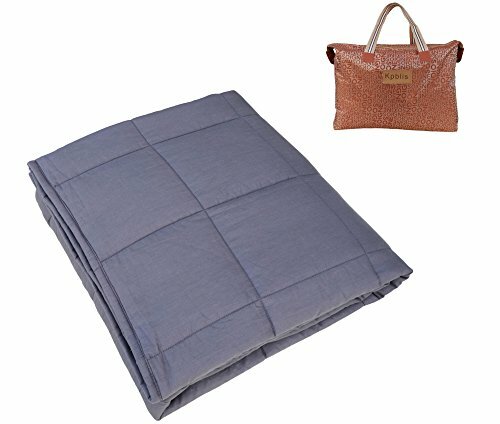 Be equal to go for a massage using our kpblis weighted blanket. At mean time, improve your quality of sleep and full of energy at whole day. 5. Increase your working efficiency. 6. Helpful to relieve the pressures of daily life. 7. 100% Cotton. Non-toxic and safe. Breathable and washable. A weighted blanket is a heavy blanket that provides gentle, even pressure, like a whole-body hug. Research has shown that this kind of pressure triggers the release of chemicals in the brain, including oxytocin, serotonin and melatonin. Our nervous system calms down under the weight of a heavy blanket creating a feeling of deep relaxation. 1. The child or the elderly do not use lonely for the first time. 2. Weighted Blankets should never go past the shoulders, and should never cover the head. 3. Regularly check for damage of the blanket to prevent the inner stuff leak out. 4. Forbid swallow the inner stuff of blanket. 5. Check with the child's therapist or doctor to advise on use and type of weighted product before purchasing. Weighted blankets should be around 10% of your body weight, which is why we're offering a variety of sizes and different weights for blankets.Choose your preference (suggested based off of weight). Customers satisfaction is very important to us! If the weighed blanket has any quality problems, please email us, you can get a new replacement or refund.Please kindly give us the opportunity to resolve the problem to your satisfy. Kpblis will provide quality after-sales service, looking forward to your patronage. If you have any questions about this product by Kpblis, contact us by completing and submitting the form below. If you are looking for a specif part number, please include it with your message.